(Phys.org) —A mile beneath Antarctica's surface, thousands of spherical digital sensors are suspended in the ice. It would seem they have nothing to record. At that depth, the ice appears pitch black. It's also clear; any bubbles have been pushed out by the intense pressure. It's deathly quiet. But the sensors—which are part of the National Science Foundation-funded IceCube Project—are looking for something. They are waiting to detect tiny charged particles that emit flashes of ghostly blue light in the dark ice. The flashes are Cherenkov radiation—the same thing that gives nuclear reactors their glow. The particles are a product of neutrinos interacting with ice, and it's the neutrinos that the scientists are actually after. The light simply indicates where neutrinos have collided with something. 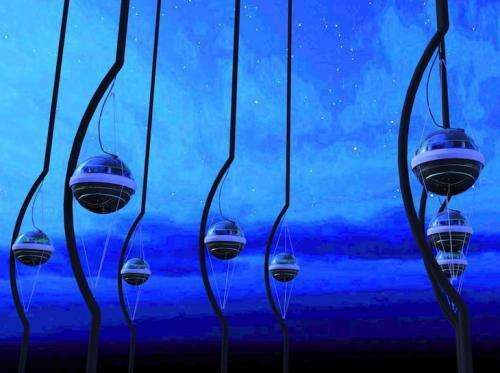 "Neutrinos are perhaps the most pervasive yet least understood of the dozen fundamental particles," said Doug Cowen, Penn State researcher and professor of physics in the Eberly College of Science. "The IceCube technology allows us to understand more about their properties and is uniquely capable of discovering the highest neutrino energies." Neutrinos are born from violent galactic events—supernova explosions, gamma ray bursts and the Big Bang. They're the second most common particle in the universe (after photons) and about 100 trillion pass through the human body every second. These particles are important because they can give scientists insight about supernovas and cosmic rays. The neutrinos travel in straight lines—by studying their energy and the direction they came from, scientists can try to trace them back to their cosmic origins. The only problem is finding them—weakly interacting and with next to no mass, neutrinos are notoriously tricky to track down and have been nicknamed "the ghost particle." That's where IceCube, a neutrino telescope, comes in. Instead of being placed on the ground facing the sky, this telescope consists of 86 strings of sensors, submerged and frozen into a cubic kilometer of ice. There are 60 digital optical modules (DOMs) on each cable. 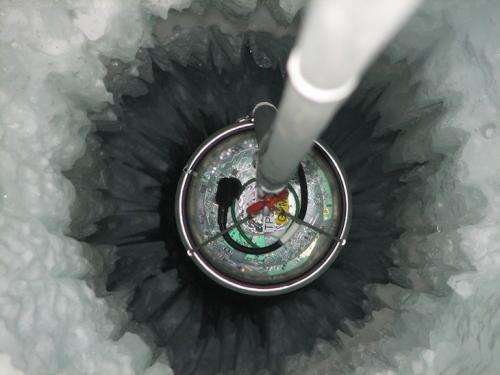 The first DOMs were deployed in 2005 by using a special hot-water drill to melt a hole more than a mile deep and then lowering a string of DOMs before the water froze around it. Setup was completed in 2010, with a total of more than 5000 DOMs entombed in the ice. It is is the largest neutrino telescope in the world. The project is already finding success: In November, IceCube reported detecting 28 high-energy neutrinos detected in the ice that are believed to have originated outside of our solar system. The IceCube effort includes more than 250 people, with 10 hailing from Penn State's physics and astronomy departments. Among the team members is Ryan Eagan, a Penn State undergrad majoring in computational physics, who is using graphics processing units (GPUs) to run simulations to better predict the neutrinos' behavior. 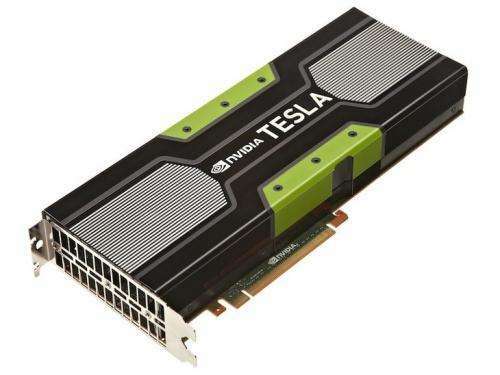 GPUs were originally created to support the greater computing needs arising from advanced graphics in computer and video games. It was soon discovered that they weren't just helpful in making more realistic-looking zombies and race cars, though—as it turns out they are also excellent platforms for particular scientific and engineering applications. "GPUs execute thousands of light-weight threads at a time," said William Brouwer, a computational scientist in Penn State's Research Computing and Cyberinfrastructure (RCC) group. "A common analogy based on a quote by Seymour Cray is that GPUs are like hundreds of chickens pulling a plow, versus several oxen. In other words, for appropriate applications, you can do many simple things at one time on a GPU to accomplish an overall task instead of, say, several heavy tasks on a CPU." The team is using GPUs to help them run simulations of what neutrino interactions look like down in the ice. Despite their chilly and remote location, the DOMs pick up a lot of data, up to one terabyte per day. To be better able to sift through the noise, the simulations give researchers patterns to look for. These simulations require the processing of incredible amounts of data. With several billion events being simulated, Eagan said it would take a lifetime to process without GPUs. "We absolutely could not do what we're doing today without this technology," he said. "The simulations run up to 100 times faster than if we didn't have these units." Cowen agrees, saying increased speed in the simulations have enabled them to better understand the data and increase the likelihood that the telescope will continue discovering neutrinos, giving access to another strange, unfamiliar world—one far beyond the deep Antarctica ice or the reach of our solar system. If it's totally black where the sensors are at and they are designed to pick up light flashes then where does the terabyte worth of noise signals come from? What causes those? I'm rather confused about this one.